AUCC, Canadian Colleges Athletic Association, CBIE, CUP, WUSC. Vancouver Island University was founded in 1936 when the Dominion Provincial Youth Training Centre opened its doors to teach automotive mechanics to a small group of students. In 1969 the school was renamed Malaspina College, named after Captain Alessandro Malaspina, who explored Vancouver Island. Following a 1988 government initiative designed to increase access to degree programs in British Columbia, five community colleges in BC were granted authority to offer baccalaureate degrees, and these five institutions — Malaspina, Fraser Valley, Kwantlen, Cariboo and Okanagan—were renamed university colleges. Initially, they offered degrees through one of the three provincial universities. Malaspina College had regional campuses in Nanaimo, Duncan, and Powell River by 1990. In the 1990s several at Malaspina promoted the idea of the institution offering something distinct—interdisciplinary bachelor's degrees in Liberal Studies — and in 1995 the institution was awarded the authority to offer degrees in its own right. In 1995, the province of British Columbia enacted legislation changing the institution's name to Malaspina University-College and allowed it to begin granting academic degrees and college diplomas. 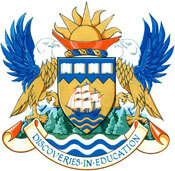 Malaspina University-College's Arms and Badge were registered with the Canadian Heraldic Authority on May 20, 1995. Malaspina University-College was upgraded to a university under an amendment of the University Act and officially began operation as Vancouver Island University on September 1, 2008. Vancouver Island University's first president was Dr. Carleton Opgaard. The first chancellor was Chief Shawn A-in-chut Atleo, who in 2009 became the national chief of the Assembly of First Nations. When VIU appointment Chief Atleo as Chancellor, he became the first Indigenous person to hold this position in British Columbia. The university press, The Navigator, is a member of Canadian University Press. The magazine Portal has been published by VIU students since 1991. Occupying three campuses and a number of facilities including a centre in Parksville/Qualicum; the Deep Bay Marine Field Station; and Milner Gardens and Woodlands, VIU has had many renovations and major developments in the past few years to accommodate its growing student body and faculty. The main campus located in Nanaimo has 908,500 square feet (84,400 m2) of built space. At this main campus the most recent facility is a new Health and Science Centre and a renovated Marine, Automotive and Trades Complex, built with funding from the federal and provincial governments as well as through community support. Another project the University is working on is a District Geo-Exchange Energy system, which will use the energy stored in the water found in the abandoned coal mines underneath the Nanaimo campus to heat and cool the University's facilities. In 2006, a 39,000-square-foot (3,600 m2) Faculty of Management Centre opened certified Leadership in Energy and Environmental Design (LEED), and a renovated 100,000-square-foot (9,300 m2) library (completed 2005) that offers extensive online and print collections, a special collections reading room, group study rooms, multimedia AV rooms, and computer stations. The VIU Campus Store is also located in the library building. The Nanaimo campus is also home to the Richard W. Johnston Centre for International Education, a gymnasium and fitness facilities; art and music studios; science and computer labs; research centres; a campus career centre; cafeterias; and a student centre on a 92-acre (37 ha) campus. Other notable areas on the Nanaimo campus include Shq'apthut: A Gathering Place, which is the home of the University's Services for Aboriginal Students; the Kwulasulwut Garden that honours Coast Salish elder and retired VIU Elder-in-Residence Ellen White; two traditional Japanese-style gardens; and the Jardin des quatorze (Garden of the Fourteen), which commemorates the women who died in the 1989 mass shooting at the École Polytechnique in Montreal, Quebec. Vancouver Island University offers master's and bachelor's degrees; two year diplomas, and one year certificate programs in a range of areas. In addition, VIU also offers English language certificate programs for English-as-a-second-language (ESL) students. Vancouver Island University offers exchange programs that allow students to study for one or two semesters overseas while remaining registered at Vancouver Island University. Current partner institutions are located in Australia, England, Finland, France, Japan, Korea, the Netherlands, New Zealand, Poland, Switzerland and the USA. Vancouver Island University also offers short-term study abroad options in some program areas; destination countries include Belgium, Belize, the Cook Islands, Indonesia, Italy, USA (New York), Tanzania, Korea, France, and Spain. Additionally, Vancouver Island University supports field schools, co-ops, practicum placements and development projects, has sister-school agreements with Japan, Korea and Thailand and educational alliances with schools in Taiwan, China, Mexico, India and Turkey. VIU’s Faculty of Management offers graduate business programs that appeal to recent graduates and those individuals who require higher education for career advancement or specialized training. VIU School of Business is one of the three Canadian business schools that have been internationally accredited by ACBSP. VIU offers a post-graduate program of Master of Business Administration (MBA) and Master of Science in International Management (MSc) jointly with the University of Hertfordshire in the UK. The 2007-08 class enrolled 102 students out of 280 applicants from all over the world, including: Brazil, Canada, China, Egypt, France, Germany, India, Indonesia, Japan, Kuwait, Malaysia, Mexico, Morocco, Nicaragua, Nigeria, Pakistan, Peru, Russia, Taiwan, Trinidad and Tobago, and Turkey. In 2015, the Vancouver Island University MBA Society hosted the first BC MBA Games. The competition was influenced by the national MBA Games and was attended by VIU earlier in the year. MBA students from across British Columbia competed in a range of intensive activities ranging from sports, case competitions and team spirit events. The event was attended by 110 MBA students from Vancouver Island University, Sauder School of Business, Peter B. Gustavson School of Business, Beedie School of Business and Thompson Rivers University. The event's theme to raise funds for families living with autism generated a total of $10,138 which was donated to the Canucks Autism Network and the Autism Society of British Columbia. The event ended with Vancouver Island University emerging as the winner of both the BC MBA Games Cup and the Mann Cup. In January 2017, for the first time ever, the National MBA games will be held in BC - at Vancouver Island University. VIU developed governing board and senate policies as well as aboriginal governed councils within the university structure. Aboriginal elders are present on campus at VIU to provide social supports. VIU has developed an Aboriginal Shellfish Aquaculture Training Program to meet specific needs within aboriginal communities. VIU also offers a bachelor's degree in First Nations Studies. The B.A. Major and Minor in First Nations Studies are products of a collaboration between Vancouver Island University and the First Nations of Vancouver Island and Coastal British Columbia. Their purpose is to provide comprehensive, high-quality education respectful of the cultures of Aboriginal peoples, while meeting their diverse needs. The Child and Youth Care Diploma Program based at the Cowichan Campus (Duncan) works with Elders and Firsts Nations leaders from the Coast Salish tradition to prepare graduates to work with children, youth, families and communities in a manner that is described as bi-cultural. The Child and Youth Care Degree program offers an Aboriginal child welfare focus which explores and supports both Aboriginal and non Aboriginal students to work with Aboriginal families and communities. ^ "VIU Consolidated Financial Statements 2014" (PDF). 2.viu.ca. ^ "Student Headcount by Institution by Academic Year 2014/2015, BC Ministry of Education" (PDF). Aved.gov.bc.ca. Archived from the original (PDF) on 6 June 2014. Retrieved 17 August 2017. ^ "Campus Information". Vancouver Island University. Retrieved April 15, 2019. ^ "Community colleges". The Canadian Encyclopedia. Archived from the original on June 7, 2011. ^ Fleming, Robert. "University College". Thecanadianencyclopedia.com. Retrieved August 17, 2017. ^ "Premier Announces Fraser Valley's First University". 2.news.gov.bc.ca. Office of the Premier, Ministry of Advanced Education. April 21, 2008. Archived from the original on June 3, 2013. ^ "Malaspina University-College, Grant of Arms, Supporters, Flag and Badge". Register of Arms, Flags and Badges. The Governor General of Canada. May 20, 1995. Retrieved August 19, 2017. ^ Development, Ministry of Advanced Education and Labour Market (12 December 2008). "VANCOUVER ISLAND UNIVERSITY EVENT CELEBRATES NEW STATUS". 2.news.gov.bc.ca. Archived from the original on 2013-06-16. Retrieved 17 August 2017. ^ “Portal.” Portalmagazine.ca. Retrieved 6 Mar. 2018. ^ "VIU Faculty of Management". Windley Contracting Ltd. Retrieved April 14, 2019. ^ "Building named after Richard W. Johnston". Vancouver Island University. Archived from the original on October 4, 2011. ^ "Malaspina University-College". Association of Universities and Colleges of Canada. Archived from the original on April 10, 2008. ^ "About Vancouver Island University". Viu.ca. Retrieved 2017-08-19. ^ "VIU School of Business receives international accreditation". The VIU News. Vancouver Island University. Archived from the original on 2011-10-04. ^ "Master of Business Administration + Master of Science in International Management". Retrieved April 14, 2019. ^ "MBA/MScIB Dual Degrees" (PDF). Archived from the original (PDF) on December 17, 2008. ^ MacDonald, John. "VIU MBA Students To Host First BC MBA Games This Week - Business Examiner". businessexaminer.ca. Retrieved 17 August 2017. ^ "VIU MBA Students Take First Place in First BC MBA Games - Vancouver Island University (VIU)". Viu.ca. Retrieved 17 August 2017. ^ "VIU MBA Students Place Best in West at Canada's MBA Games - Vancouver Island University (VIU)". Viu.ca. Retrieved 17 August 2017. ^ "The University of Winnipeg" (PDF). Uwinnipeg.ca. Archived from the original (PDF) on 26 June 2008. Retrieved 17 August 2017. Wikimedia Commons has media related to Vancouver Island University.